My fellow Entrepreneur, are you making a living doing what you love? Are you ready to play on a bigger stage? I’m so glad you’re here! 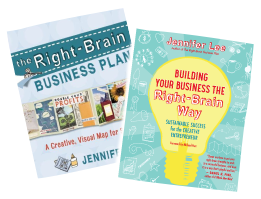 I’m Jennifer Lee, the founder of Artizen Coaching ®, and the author of The Right Brain Business Plan and Building Your Business the Right-Brain Way . 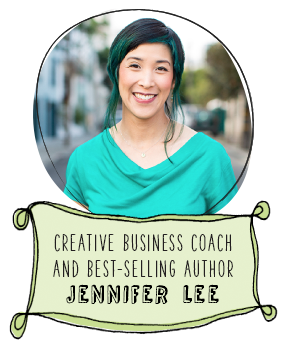 I help creative people like you turn your ideas into profitable and sustainable businesses. If the idea of writing a business plan makes you cringe, but you know that you need a viable way to grow your business, you’re in the right place! You own a small business. That doesn’t mean you have to stay small. Building Your Business the Right-Brain Way will help you move up to the next level and sustain it, too! Are you starting out and looking for a way to turn your dream into a profitable business? The Right Brain Business Plan has helped tens of thousands of entrepreneurs do just that. Through creative and visual ways. Check out some of our offerings below and make sure to grab your free 7-day mini course. 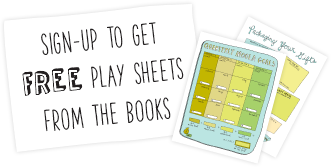 plus mp3 visualizations, a video class, and more! Want to get the latest updates and tips? We’d also love to send you our bi-weekly newsletter with tips and resources for your creative business/life along with other occasional special announcements. I’d love the opportunity to work together and help you grow the creative business of your dreams! Whether that be through my two books, our home study programs, or coaching together 1:1, I’d be honored to help you on your entrepreneurial journey.